BaZi Chinese Astrology is based on a person's birth date and time. It is a complex and deeply fascinating practice. Originally used to personalize a person's Feng Shui, BaZi is now a stand-alone practice and elite service used by Fortune 500 CEOs and business leaders throughout Asia. BaZi Experts are employed to guide tycoons daily on business decisions and dates for transactions and investments. As one of the few practitioners in the West doing this type of work, BaZi Astrology is one of my specialties. Successful people have coaches. Spiritual people have cosmic coaches. 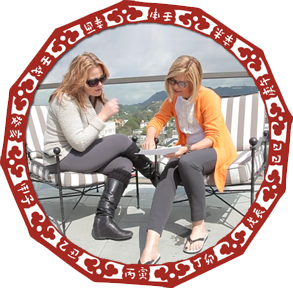 Whether you consult your BaZi for personal or business issues, Chinese Astrology is a transformational tool. The more you know about yourself the more options you have to make better decisions. With clarity you gain focus. Let me help direct your BaZi so you can shine in the spotlight of your life. Cosmic Coaching utilizes a variety of high level tools, but the place to start is with an initial BaZi consultation because everything in your life is written in your BaZi chart: career talents, wealth potential, health and healing, children and all relationships. It is an in-depth journey into who you are and how you navigate the world. There is no one-size-fits all business or life plan. Everyone is unique and what works for Oprah Winfrey (Yi Wood Philosopher Profile) does not work for Jeff Bezos (Geng Metal Performer Profile.) For business, we want to work ON our business not just IN our business. As an artist, photographer, designer, film director and now a spiritual practitioner I have had success in a variety of creative fields. Not only am I accredited in a wide range of metaphysical tools, I was one of the first female director's in Hollywood and built a million-dollar global decor business in a few years. As an award-winning author, journalist, and International speaker I understand what it takes to build a brand, market your services, premiere a Hollywood movie, source products and import containers from China. Keeping current on trends, social media platforms, and understanding how to monetize talent (as a Ren Water Wealth Profile) puts me in a unique position to help you. Seasonal Coaching to set goals and keep you on track. Date Selection Calendar on Google for easy phone access. It's a must-have daily tool for your morning ritual. Use to tap into daily Qi and schedule all important activities. "The best present I've given clients (including Jen Aniston, Justin Theroux, Gwyneth Paltrow, Orlando Bloom, Miranda Kerr and Selena Gomez) is Anita's BaZi Wealth Forecast. They flipped out at the accuracy and inspiration that they received and said it was the best gift I've ever given them and "I take my gift giving very seriously!" "Anita is a true expert in Chinese Metaphysics and took me on an incredible journey of self-discovery! Meeting with her as a cosmic coach gave me an enlightened awareness of myself and the tools to break old patterns that kept me from reaching some of my personal goals. I was immensely impressed by her knowledge and insightful information that was 'spot on' when reporting on my personality. In addition to an extensive written report, Anita gave me some concrete advice and techniques on how to better navigate my life. Thank you Anita for all of your guidance - I loved our time together and learned so much!" "Anita's BaZi Business reading for our creative team was insightful and freakishly right on. We now have a valuable guide for moving forward making practical decisions." "I met Anita at a workshop she did for YPO Delhi chapter. One week after meeting Anita I was in LA with my core team and used Anita's services to determine the BaZi Business Profiles for those individuals. We were collectively shocked at how much truth there was and how much information was revealed through BaZi Astrology of a person's personality. Thank you Anita for this unique experience." INTERESTED IN RECEIVING MORE INFORMATION ON BAZI & QI MEN CONSULTATIONS?